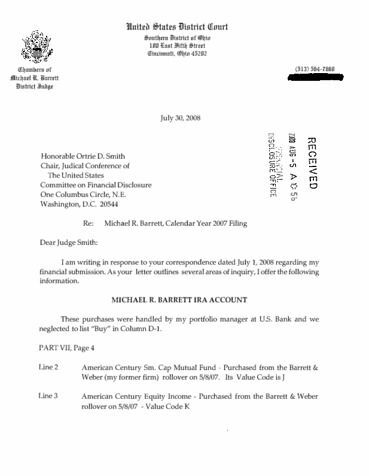 Dear Judge Smith: writing response your correspondence dated July 2008 regarding financial submission. your letter outlines several areas inquiry, offer the following information. These purchases were handled portfolio manager U.S. Bank and neglected list "Buy" Column D-1. The following transactions are -Custodial Trust Account and "Buys" and "Sells" were made by-and his portfolio manager U.S. Bank. and his portfolio manager purchase the above listed "Buys" within his account. Blackrock Fundamental Growth Fund. listed Page Line the 2008 Report. Thirteenth Entry was totally sold and there was listing the current report. This was reported the 5/8/2007 Financial Disclosure. They sold part June and the balance August, 2006. Line Should have been "P-1". This was just error the Value Codes only. Line Rowe Price Med Cap Value -Sold 1/17/2007 Value Code hope this information helpful you and please contact there anything further you need. more than happy provide Amended Financial Disclosure you need it.